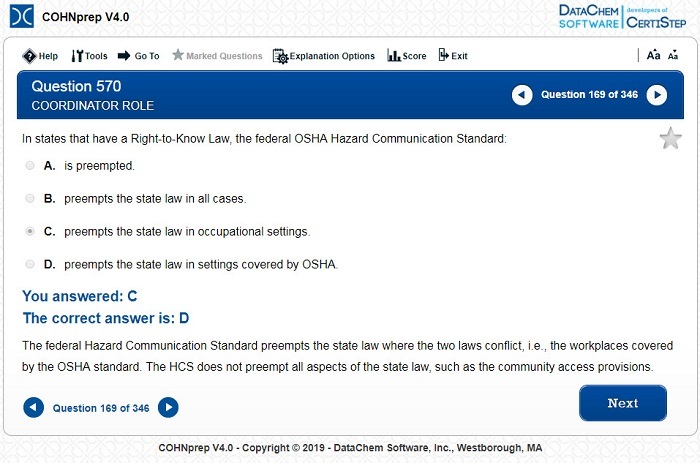 The software is designed to prepare the user for the Certified Occupational Health Nurse Certification exam. The COHN exam is offered by the American Board for Occupation Health Nurses (ABOHN). Cynthia Rosa Lawson is the author/editor of COHNprep and COHN-Sprep programs. Active in the field of Environmental Safety and Health for more than 40 years, she has been responsible for the design and implementation of risk management and in-house medical programs for both national and international corporations. She has lectured extensively on these topics to professional and trade organizations. The success of these programs has been recognized with numerous awards from the National Safety Council, the Connecticut Division of Worker’s Education and Connecticut Business and Industry Association. Ms. Lawson has served as Chairperson of the CT Safety Advisory Board, has held several board positions with the Connecticut Occupational Health Nurses Association and served on the Connecticut Workers Compensation Advisory Board. She earned a Bachelors Degree in Nursing from Western Connecticut State University, and Master of Science Degree in Occupational Safety and Health Management from the University of New Haven. Ms. Lawson is a Registered Nurse and a Certified Occupational Health Nurse Specialist (Retired).